We're passionate about Electronic Test & Measurement Accessories. Test & Measurement accessory users like their testing equipment customized to fit their specific applications. Thankfully, E-Z-Hook is more than willing to work with our clients to meet their demands. Give us a call and let us know what you are looking for in your electronic test accessory so we can work with you to fulfill your request. See how we have helped others meet their needs here. Your project requires special custom cable assemblies with intricate configurations and specifications, but you don’t want to use your engineering department’s precious time to make cable assemblies. Yet, your requirement seems too low of a volume to farm out to a manufacturer of cable assemblies. Wouldn’t it be great if there were a cable and lead assembly manufacturer out there for whom Custom assemblies were their Standard? 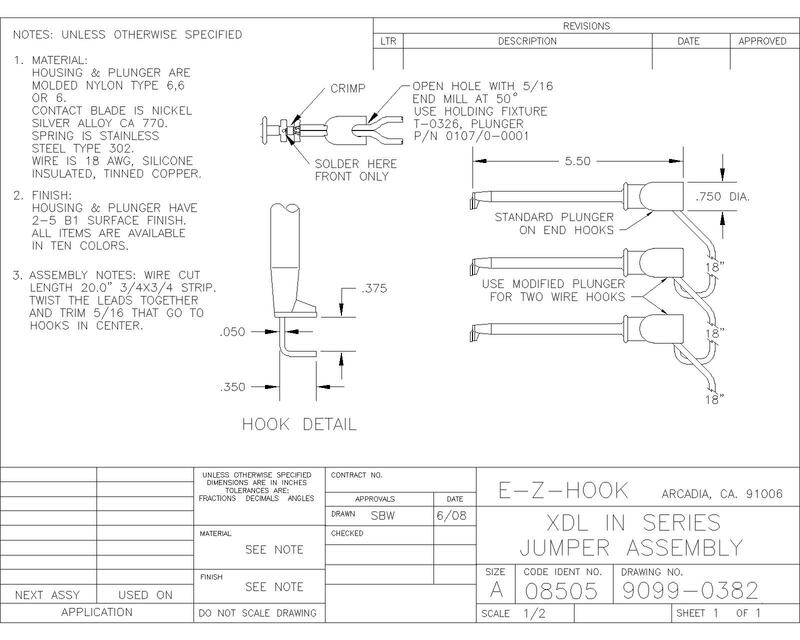 At E-Z-Hook, we’ve ” got ” your custom assembly ready. Can’t Find It? Let Us Customize It For You! Using a standard product from our catalog, our alligator to banana plug patch cord we were able to accommodate a client’s need to run 115 volts with 11 amps and 220 volts with 7.0 amps through a patch cord by providing a larger gauge wire (14AWG) in place of the standard 18 AWG. Having various wire gauges in house we can quickly respond to our client’s needs and provide a customized product, made just for them. At E-Z-Hook, you can have it your way. XKM is a worldwide hit! A recent customer required special a multiple hook-up in series. While this isn’t a product listed in our standard category – we were able to put this together for our client with little delay. E-Z-Hook designed the multiple heavy duty connector to fit the customers’ requirement in series connection. Because it uses our standard products, simply rearranged to suit a custom environment – we can offer these customized products at great prices. A multitude of various E-Z-Hook connectors can be connected in this fashion for this type of special requirement. Look to E-Z-Hook to help solve your problems with quickly hooked up connectors! We’re committed to the highest quality products throughout all our line. And we want to make your lives easy, too. Recently, a customer requested a revision of an initial custom coaxial cable request to produce a lower cost unit. It was decided that a Right Angle Male BNC was too expensive for their requirement. We quickly revised the cable for the same form/fit and function and sent out a new approach which fit the requirement and cut the cost to approximated 50% of their 1st request. The initial requirement was for 8 cables. No job too small! Our latest product, P/N 8507 has been nominated for a King Award. We’re particularly excited about the innovative solutions this product delivers. We’re certain it will help many other harness board environments, too. Insulation piercing connector designed for harness board applications. Accepts wire diameters up to .20” (5mm). Wire can be inserted from multiple angles within the 180 degree opening. Spring tension of 7 pounds actuates product into open position. Product available with 4 different threaded studs and is offered in 10 colors. This new retractable shrouded stacking banana plug test lead jumper P/N 9947 uses 18 awg, PVC insulated test lead wire. The product is CAT 2 rated to 600 VRMS. This banana plug jumper is available in Black, Red, Yellow, Green, Blue and White. Standard lead lengths are 6”, 12”, 24”, 36”, 48” and 60”. Don't miss a single beat from E-Z-Hook. Every month, we share special deals, important news and trade secrets with our most valued customers.